Wakesurf or wakeboard tower racks for your boat come in a variety of styles and shapes, but the purpose is always the same - storage and organization on your boat. If you’ve ever been out on the boat with friends, coolers, and all your favorite toys, then you’ll understand how precious of a commodity space is on your boat. Two options featured on some tower racks are clamps and swivels. Wakeboard boat tower clamps and swivels accomplish the same task – they bind your rack to your boat’s tower. They are a necessary part of a rack system. CLAMPS: simply lock onto your rack on one side and then lock onto the metal tubing of your boat’s tower on the other side. The clamp should provide a solid mounting point for your rack. Features you will want in a clamp are that it is rustproof (either Aluminum or Stainless Steel), and it is rattleproof - a rattling rack is a noisy nuisance. 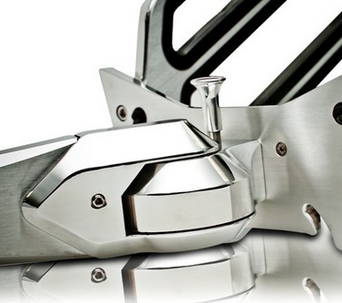 SWIVELS: are just like clamps, but they have the added functionality of …well, swiveling. In their normal storage position, clamps have the rack and your boards pointing out away from your boat. In order to remove or place boards into your rack, you have to reach to the outside of your boat. The swivel allows you to easily spin the rack around to face the inside of the boat. This seems inconsequential at first, but after you’ve had the convenience of not having to lean out over your boat to get your board out, you’ll be hooked and won’t want to go back to a non-swivelling wakeboard rack. Check out all our wakeboard and wakesurf tower racks here!